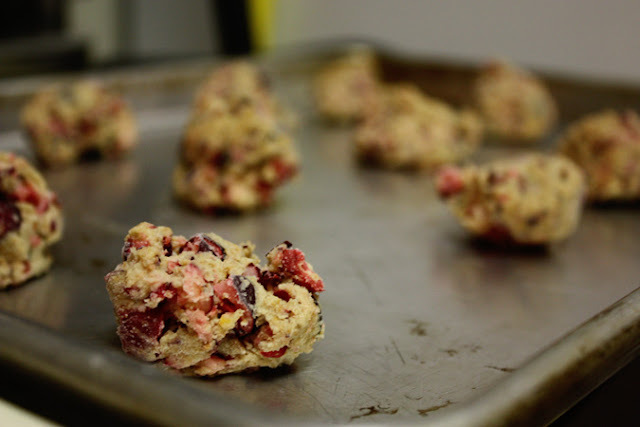 *I use whole wheat flour and I leave the amount the same on these cookies. The dough is pretty wet if you use all purpose flour, so you might want to add a wee bit, but this is what the recipe says. Also I really love whole wheat flour. I think it makes a better tasting cookie, plus it's better for you. Not that these are good for you. They are cookies, ok? ** I never know whether to chop nuts before or after I measure them, and it usually isn't all that critical, so I just dump a bunch out on my cutting board and go to town. Or if I dont' have nuts I don't worry about it. These ones didnt' have them, but they are good with too. Obviously. Or it wouldn't be in the recipe. **** Just dump some in. This is how I cook, ok?